No matter how many times we go to the Bahamas, we cannot wait to return. Its pristine beauty never ceases to amaze us. Like many cruisers, we have our favorite routes and favorite islands. Also like many cruisers, our favorite way to truly sample the flavors of the Bahamas is finding those perfect spots to anchor. Anchoring in the Bahamas offers some unique challenges that aren’t often encountered cruising inland coastal waters. Bottom conditions can range from excellent in sand to very difficult in scoured-out rocky channels. Some of the most problematic bottom conditions will be heavy grass and thin layers of sand over a rock base. Heavy grass tends to foul the anchor, and thin sand over rock doesn’t give the anchor a chance to dig in. We have found generally good holding in most of the anchorages we have visited on our trips that have covered from the Abacos, to the out islands, to the extreme southern islands. We have also encountered some of the more problematic conditions firsthand. Anchoring close to a cut or a break in a Cay can result in a very rolly anchorage. This route takes you over to the Bahamas via Bimini, then a visit in the Berry Islands, then over to and down the Exuma chain. Clearing in at Bimini, you can anchor at a couple of spots. The most preferred is off the docks of the Big Game Club in Alice Town. The marina offers dinghy access to town. The second is at the northern end of the harbor near the new resort and casino in North Bimini. With any anchorage in the Bahamas, check to be sure the anchor is well set and be aware of the strong currents in Bimini Harbor. The next night, due to the distance across the Banks, you will likely anchor on the middle of the banks well the rhumb line to avoid nighttime traffic. If you pick that good weather window, you should have benign conditions for anchoring in the middle of nowhere. The water depths are uniformly 8-12 feet so anchoring there is not a problem. Show a very bright anchor light! 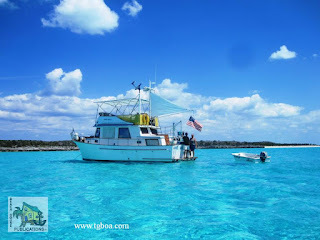 Upon departing the Bimini area, you will either have to head north to North Rock or south to North Cat Cay to cross onto the Great Bahama Bank. For deeper-draft vessels, you will have better depths on the northerly route across. After clearing in at Bimini, one can head north to North Rock, then head almost due east to Great Harbour in the northern end of the Berry Islands. 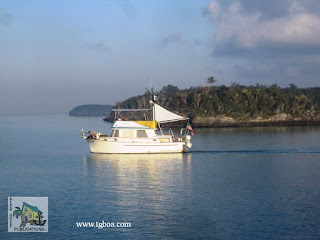 Leaving at daybreak and heading across the banks will put you close enough to the Berry Islands to anchor and finish the trip in the morning for slower vessels or a long day to anchor at dusk for trawlers. This gives you an opportunity to begin your Bahamas trip in The Berry Islands and cruise through the many delightful anchorages. The anchorage at Bullocks Harbor gives easy access to the settlement and the town dock for landing the dinghy. Beware of the thick grass on the bottom and look for a sandy patch to drop the anchor. Inside Hawksnest on the east side of Great Harbor Cay is a spectacular anchorage with miles of white sandy beaches. 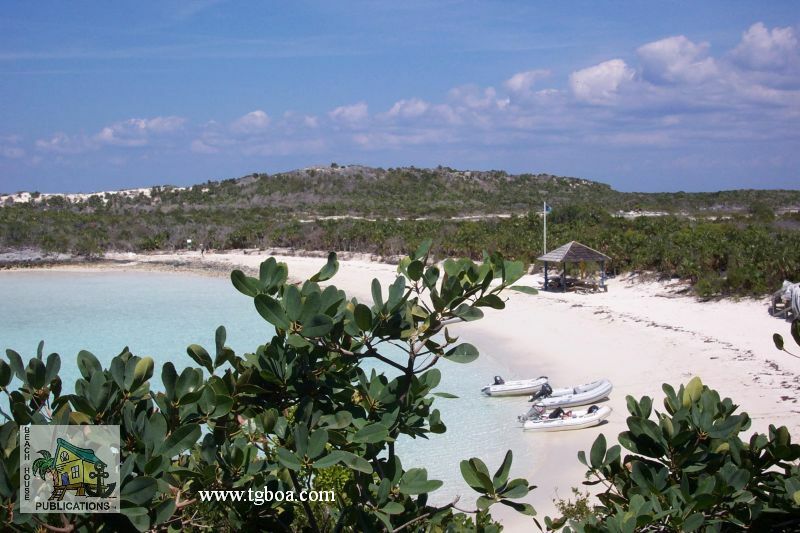 Soldier Cay, Hoffman’s Cay, White and Fowl Cay offer days or even weeks of solitude and exploration. Cruisers can easily spend a month or more just exploring the many anchorages throughout the Berry Islands. Nassau on New Providence is usually the next port of call. Anchoring in the harbor can be difficult. Nassau Harbour’s bottom is like trying to anchor on a parking lot. It is hard with little to grab a hold of except hurricane chains. The current has scoured it clean. 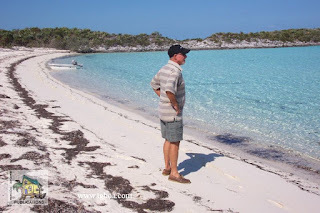 There are a couple of sandy patches with fair holding just west of the bridge to Paradise Island or off the eastern channel near Nassau Harbour Club. Currents are strong and boat wakes are a problem. If you don’t need provisions or have already cleared in, we recommend anchoring at Rose Island, northeast of New Providence. 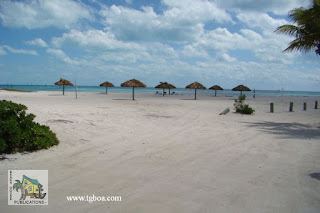 It’s far away from everything but a good place to stage to head south into the Exumas. Your next destination will be the Exumas. Starting at Allen’s Cay at approximately 24.45’ N and running south to Georgetown at about 23.30’ N. Anchorages are plentiful and each should be considered based on the how much wind protection you need and from what direction. The trip from Nassau or Rose Island to Allen’s is about 28 NM and takes you across the “dreaded” Yellow Banks to the Exuma chain of islands. The banks are not as formidable as some cruising guides would suggest. Ensure you transit the area with the sun high overhead and have someone in the bow or flybridge or as high up the mast as needed for a good view of your path ahead. The coral heads are easily negotiated. As you travel south in the Exumas, your daily runs will be short so you don’t miss any of the wonderful anchorages in the 100 or so miles to George Town. 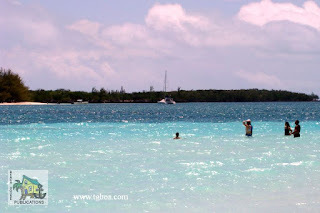 Some of the highlights are Allen’s Cay, with its greedy iguanas, Norman’s Cay with its western beach and cozy inner anchorages, Warderick Wells, possibly the most beautiful place on the planet, and Staniel Cay with its friendly townspeople, the Thunderball Grotto of James Bond fame, swimming pigs and plentiful anchorages in and around the town and outlying cays. Farther to the south is the settlement of Black Point, another friendly outpost, and Farmer’s Cay with its yacht club festivities. Between there and George Town are any number of remote locales to drop the hook. 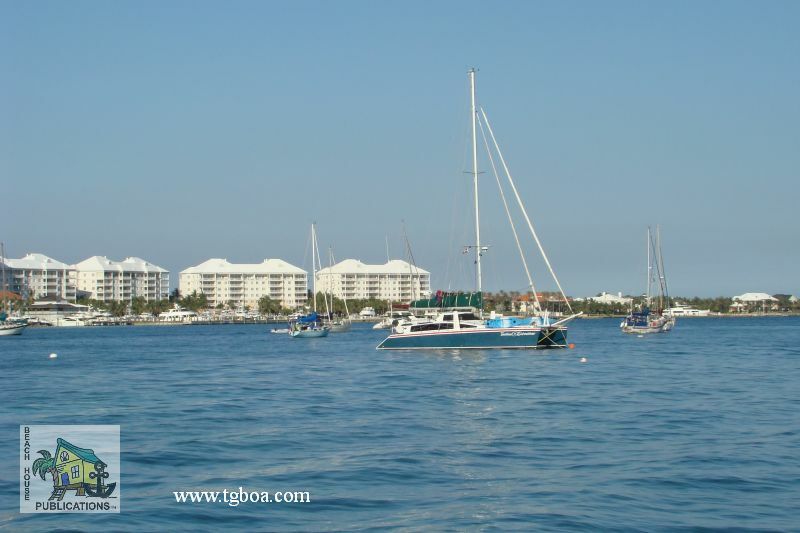 Deep-draft boats will likely exit at Galliot Cut to make for George Town (a trip of about 34 NM), while shoal-draft vessels can travel along the inside to Ray Cay, Square Rock or Glass Cay Cuts before heading out into Exuma Sound for George Town at Conch Cay Cut (a trip of about 13-15 NMs). Many boats just make for George Town and plant themselves there for the duration. Once you get there, it’s easy to see why. There are activities every day on the beaches on Stocking Island, places to provision ashore and friends to catch up with. George Town does present a number of anchoring options. Anchor off Stocking Island in the various locations–Church Bay, Volleyball (Hole 1) or Sand Dollar (Duck Bay) Beaches–or raise the anchor and head across to anchor just off the town in Kidd Cove for that provisioning or laundry that needs to be done. Or, follow the path into Red Shanks behind Crab Cay on the south side of the harbor. When you are ready to depart George Town, before you grow to the bottom, you have a number of options. If you have a little extra time, head back north in the Exuma chain until back to Warderick Wells again. It is so wonderful; it deserves two stops on anyway. 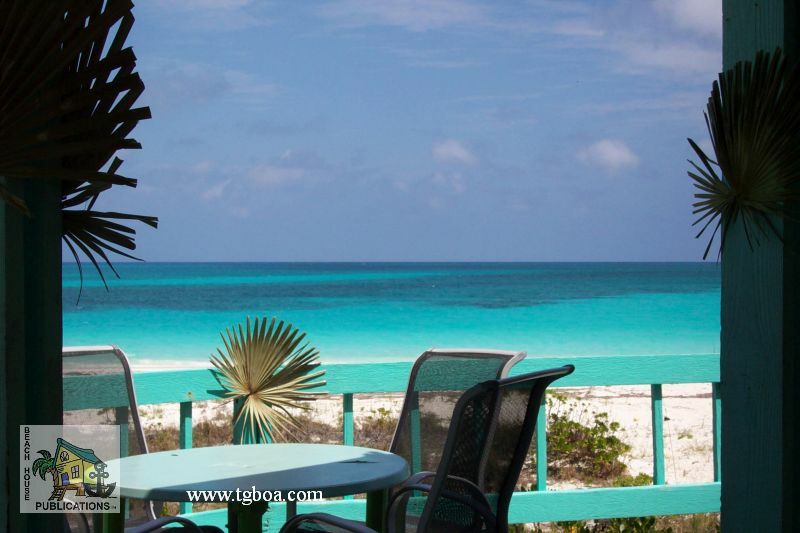 From Warderick Wells, exit Warderick Cut and make the 30 NM run northeast to Powell Point on Eleuthera. Heading around and into Rock Sound, one finds yet another friendly Bahamian Settlement with an anchorage just off town. Pick your spot in the sound based on the forecast wind direction. From Rock Sound on the west side of Eleuthera, there are any number of great anchorage stops, including Ten Bay and South Palmetto Point, Governors Harbour, Hatchet Bay (360 protection), Rainbow Bay, Current Cut Settlement and Spanish Wells. None of the anchorages are more than 20 or 30 miles apart, making for easy daily runs. The area around Spanish Wells is deserving of a few days at least of exploration due to its interesting past. 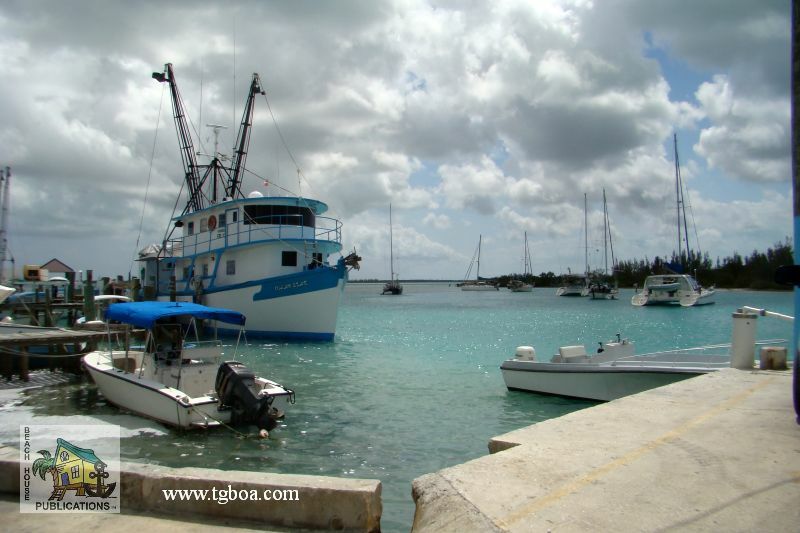 Take the ferry to Harbour Island to explore Dunmore Town. From Spanish Wells or Royal Island, you’ll then make your way north to the Abacos to wrap up your winter excursion through the Bahamas. The crossing to Little Harbor from either Spanish Wells or Egg Island ranges from 45 to 50 NM. This may be one of the longest crossings you’ll have to make during your stay in the Bahamas. Make sure you have a very good weather window for this crossing. After crossing, enter through the reef between Little Harbour and Lynyard Cay and head north for the anchorage behind Lynyard, or west and south to the wonderful little harbor at, you guessed it, Little Harbour if your draft will allow. The harbor will be for shoal-draft vessels only and will be your key to rich Abaco history and the history of the Johnston family who settled this area. The Lynyard Cay anchorage is close enough to anchor and dinghy to Little Harbour and provides good holding and protection from prevailing easterlies. From here, many more anchoring opportunities present themselves as you work your way north. Tilloo and Elbow Cays offer anchorages on their west sides, only 10-15 NMs away. On the north end of Elbow Cay is Hope Town, a must see. You will need to anchor outside of the harbor and dinghy in due to the mooring field and docks inside–anchoring inside is now prohibited. 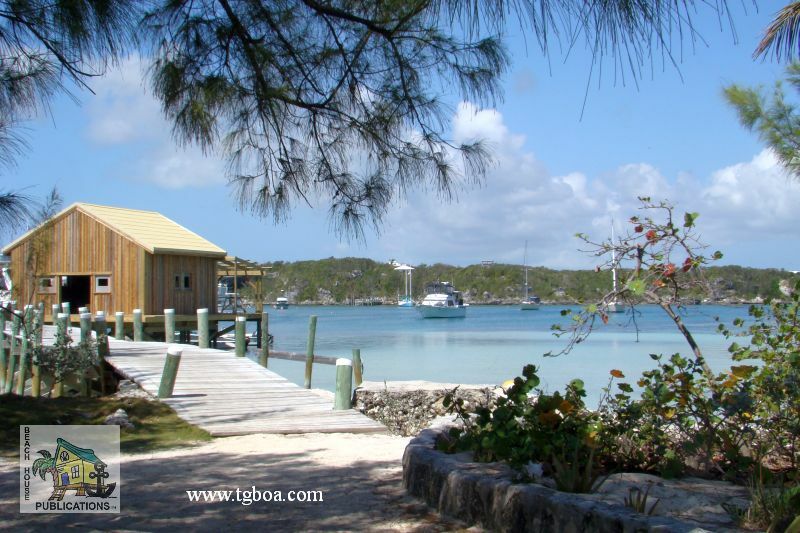 The hub of the Abacos, Marsh Harbour is only about 10 NMs to the west and Man O War less than that to the north. You could spend weeks in this area bouncing back and forth between these wonderful places. Moving onward into the Sea of Abaco, some of our picks for anchorages are Treasure and Great Guana Cays, then through Whale Cay Pass to Green Turtle Cay. There are moorings in both basins on Green Turtle, so you may want to anchor outside near Joyless Point or off the New Plymouth Settlement, but you will be able to find room inside as well; just watch the holding. 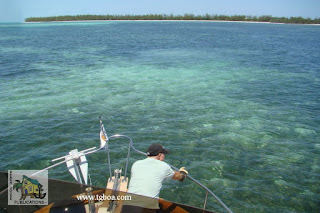 We also love the anchorage at Manjack and Crab Cays, about 5 NMs to the north of there. 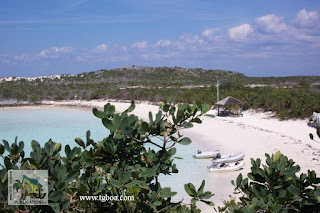 Powell Cay is a short hop north of Manjack with Spanish Cay just beyond. Once you reach Crab Cay, you will need to decide if you will head northwest and visit some of the other favored spots in the Abacos, such as Allans-Pensacola and Grand Cays, or head west toward Hawksbill Cays and Fox Town. 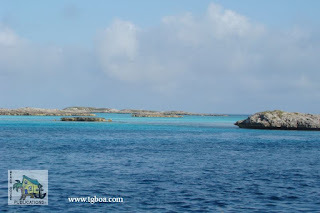 Your exit from the Bahamas on the lower route will take you past Great Sale Cay. Most folks anchor in the cove on the west side which offers protection from the northwest through southeast. The east side of Great Sale is also great for those occasional westerlies. 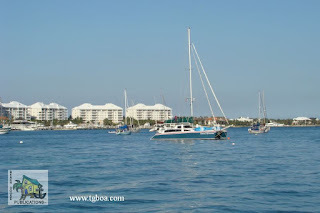 Then, head past Mangrove Cay and to anchor near West End. The next morning, cross to Lake Worth Inlet, a distance of about 56 NMs, or to St. Lucie Inlet, at about 67 NMs. Wherever your destination in the Bahamas might be this time around, there will always be more anchorages to explore on your next trip. 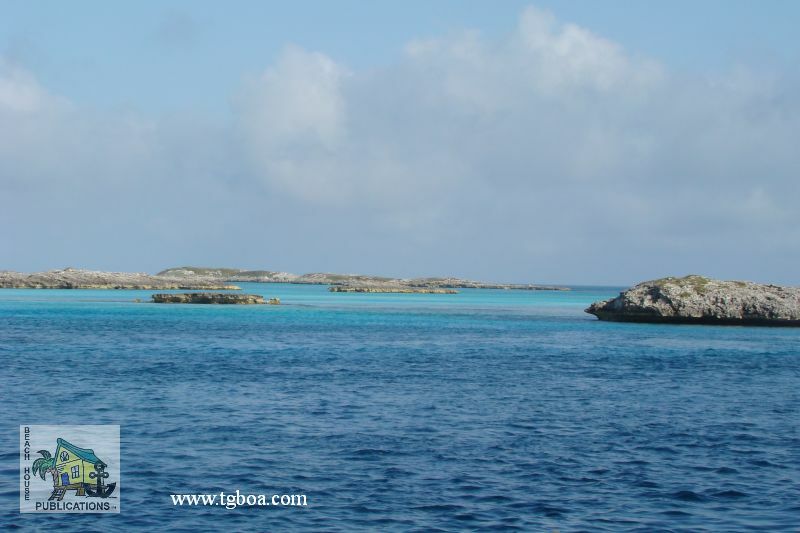 You can find all of these anchorages and many more with complete details in The Great Book Of Anchorages, The Bahamas. Order your copy today. During our last journey through the Bahamas the “Next Generation” anchor has proved itself to be the best all around anchor we have used. Our choice is the Manson Supreme, but there are others with very similar designs and characteristics that will do as well. The prudent skipper will carry a second anchor for those severe weather conditions and the few times a second anchor is needed to deploy a Bahamian Moor. The Bahamian Moor is two anchors set off the bow at a 180° angle from each other, used to keep the boat’s swinging circle limited to a small area. It’s good for strong reversing currents, like those found in cuts, or where there is limited space. Anchoring in the Bahamas offers some unique challenges. Often heavy grass will blanket large sections of some of the better anchorages, which prevents the anchor from setting properly. Look for sandy patches, seen as white patches within the grass. Pull forward to the edge of the sandy patch, drop the anchor and back down slowly until the anchor has set about in the center of the patch. Once the anchor rode is stretched out, back down slowly until you are comfortable the anchor has set. It’s a wise idea to snorkel over the anchor to be sure it is indeed set. Beware of what might look like a sandy bottom but is actually a thin layer of sand over rock or coral. If the anchor appears to be set, it may only be in a narrow crevice and will release as soon as the boat shifts on the rode. Many times the anchor will simply skip across the bottom. In this situation, it’s often best to try and relocate to another spot. In many of our anchorages, good holding in deep sand is the norm. Even in a sandy bottom, small patches of rock and coral are often present. Boats going to the Bahamas should have sufficient amount of the correct size chain as a primary part of the anchor rode. Most anchoring will be done in 10 feet or less, so a minimum of 100 feet is recommended. The more, the better. Nylon anchor rode can and will chafe through very quickly rubbing back and forth on a piece of rock or coral. Weather conditions and wind strength and direction will play a very important role in where to safely anchor. Make monitoring the weather and knowing what conditions to expect part of your regular anchoring routine. Most of all, enjoy, be safe and have fun. Chuck Baier and Susan Landry have been cruising together as a couple for almost 25 years, first on their Mariner 40 Ketch, Sea Trek, and currently on their Marine Trader trawler Beach House. Chuck and Susan are owners of Beach House Publications, publishers of The Great Book Of Anchorages series of anchorageguides. The Guides cover the Chesapeake Bay, Atlantic ICW from Hampton Roads/Norfolk to Key West and include the St. Johns River, the Bahamas – The Route Most Traveled and the Gulf Coast from Cape Sable to Mobile, including the Okeechobee Waterway. Chuck and Susan have been freelance writers for over 15 years and have written for almost every major boating publication and many online boating sites. The duo have cruised the Atlantic and Gulf coast of the U.S., the Bahamas, Turks and Caicos, and the northern and western Caribbean. Chuck is former GM and Susan is former Editor of Waterway Guide. Thanks for this valuable information, it is a great post. I would definately recommend TGBOA in addition to this. Hope you guys are well. Take care. Thanks for the kind words Will. We are doing great. Hope all is well with you.